Just a quick note. 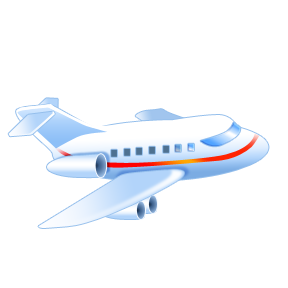 I’m up at 5:30 am today packing a few last minute things then heading to the airport to fly from Vancouver to Halifax for the first Canadian National Conference on Peer Support organized by Peer Support Accreditation and Certification Canada (PSACC). I tend to find conferences pretty tiring, but my plan is to blog about it here, so if your interested, stay posted. For those of you on Twitter, I’m going to tweet about it also. I’m told the hashtag to use is #ncps2014. We had a researcher, Seema Shah, do a follow up survey with our Peer Support Training Alumni with folks who graduated between 2007 and 2012. I’ll be presenting on that with her and one of our training grads and Peer Support Workers, Tracy Windsor. Wish us luck! Job Description: Under the supervision of the Occupational Therapist, and in conjunction with treatment team personnel, you will work with clients with mental illness with the objective of assisting them to achieve their stated goals. The successful candidate will be a well-organized individual who exhibits initiative, flexibility, sound judgement and good interpersonal skills. Duties include one-to-one work assisting clients in achieving goal(s), acquiring new skills or linking with community resources; communicating all relevant information verbally and in writing to pertinent staff; and attending monthly peer support worker meetings, at the team or unit and centrally. Duration of these Placements: 6 Months, temporary. Pay and Hours: $12.00 an hour, up to 20 hours maximum a month (including meetings). Please note: there is no Vancouver Visions and Voices Group Meeting on Good Friday, April 18th, 2014 because it is a stat holiday. What is the Hearing Voices Network? The Hearing Voices Movement was begun by Dr. Marius Romme, a professor of social psychiatry, science journalist Dr. Sandra Escher and voice-hearer Patsy Hage in 1987 – after Hage challenged Romme about why he couldn’t accept the reality of her voice hearing experience. As voice hearer Ron Coleman has said, if someone is hearing voices, something real is happening. The Hearing Voices Network began in 1988 with the support of Romme and has since expanded to countries including Wales, Scotland, Switzerland, Sweden, Austria, Germany, Norway, Denmark, Japan, Israel, New Zealand, Australia and Canada. Hearing Voices Groups support people in learning ways to live well with their experiences, share strategies, make connections and know that they are not alone. The reputation of the Hearing Voices Network is growing as the limitations of a solely medical approach to voices become better known. Why am I drawn to the Hearing Voices Network? I remember a time when I was really struggling with the voices I heard. They were negative, nasty and constant. I was in such distress I was contemplating suicide. I was also on “extended leave”- a form on involuntary treatment taking place in the community that meant I was required to see a psychiatrist and case manager and to take medication. I remember going to my mandatory appointment with the case manager and telling her I needed to find new ways to cope with my voices. Her response was to tell me that the way to cope was to take medication. She then went on to talk about what a good medication I was on. Only….I was already taking medication. I was still hearing voices. I wished that she had more tools to offer me. Sometimes medications take a long time to work. Sometimes they don’t work at all. Sometimes quality of life is severely impeded by side effects. I like the Hearing Voices Network because it offers more tools. It has the potential to change lives. The BC Hearing Voices Network had it’s inaugural meeting on Nov. 21, 2013 with representatives from existing local Hearing Voices Network Support Groups. The first local group established in BC is the support group run by North Shore Community Psychiatric Services. The second is run by Vancouver Community Mental Health and Addiction Services through the Peer Support Program. The third is offered in Tertiary Mental Health Services. The movement is growing. A hearing voices group for youth has recently been started by the Unitarian Church. A fifth group is looking to start in the community. The UBC Masters in Occupational Therapy Program is looking at doing a related research project to add to the evidence base for these groups. The group run through Vancouver Community Mental Health and Addiction services is open to anyone with experience seeing visions or hearing voices as well as their allies. You do not have to be a client of the mental health system. It is a peer-led, drop-in support group. For more information, you can call 604-708-5276 or see the flyer below. The North Shore Group is also open to community members. 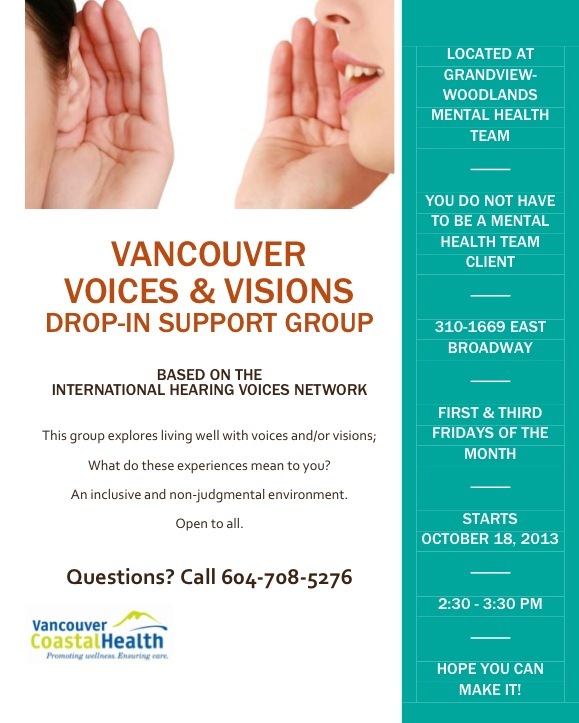 For information on the North Shore Hearing Voices Network Group you can call: 604-983-6020. For information on the youth oriented Hearing Voices Network Group run by the Unitarian Church call 604-261-7204 and leave a message for Diana.